Ipomoea are usually grown as annuals in the garden, although they can often be perennials. 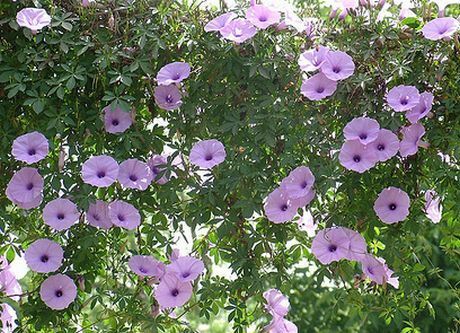 They are a climbing plant that blooms with trumpet shaped flowers of pink, blue, white, purple or red (often two coloured) from summer to the early months of autumn. 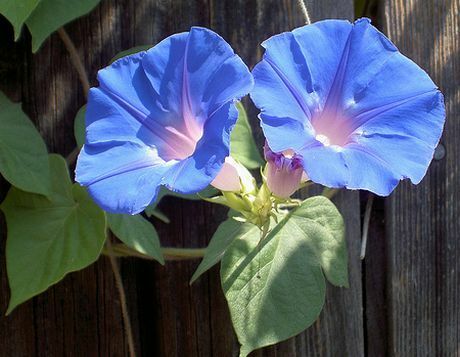 Some of the common names for Ipomoea are Morning glory, Cypress vine, Messina Creeper and Moonflower. Ipomoea cairica - Messina creeper by Eran Finkle. Common Names: Morning Glory, Messina Creeper, Cypress Vine, Moonflower, Moon Vine, Sweet Potato, Water Spinach, Swamp Cabbage. Life Cycle: Half hardy annual. 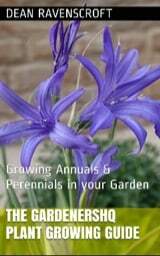 Half hardy perennial commonly grown as a half hardy annual by gardeners. Height: 80 to 240 inches (200 to 600 cm). Growing Region: Zones 3 to 10. As a perennial in zones 9 and 10. Flower Details: White, blue, pink, red. Often bi-coloured. Trumpets. Sow Outside: Surface 1/4 inch (6 mm). A couple of weeks after the last frost. Spacing 12 to 30 inches (30 to 75 cm). Sow Inside: Best started outdoors. Chip seeds then soak overnight. Use peat pots. Germination time: one to three weeks. Temperature 75 to 85°F (24 to 30°C). Three weeks before expected last frost. Transplant outdoors about four weeks after the last frost or in autumn; temperature must not drop below 46°F (8°C). Requirements: Full sunlight. Good drainage. Soil pH 6 to 7.5. Light soils. Provide trellis. Pinch tips. Miscellaneous: A very useful genus of plant containing members that are ornamental plants, food sources, used in rubber production, and used in medicine. If growing sweet potatoes best results occur in light soil with good drainage and an acidic pH of 4.5 to 7. It is best to grow morning glory in their final location outdoors. Sow the seeds at a depth of 6 mm in a sunny area of the garden a couple of weeks after the last frost of spring. Ideally the soil that morning glory grows in will be moist and of pH 6 to 7.5; not to high in nitrogen or this will lead to straggly plants. Ipomoea Plant Germination takes from one to three weeks, and can be enhanced by first chipping the seeds and imbibing in hot water for a day prior to sowing. Once the young morning glory seedlings have emerged they should be thinned to be about 30 to 45 cm apart, and given a trellis to climb upon. 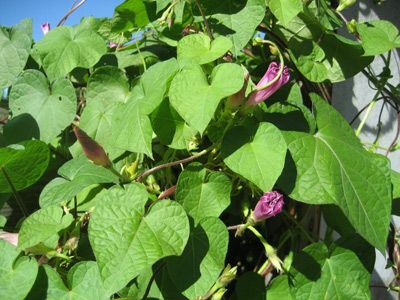 Once morning glory starts to climb on the trellis, pinch back the growing tips to encourage branching growth.